DES MOINES – The Iowa Barnstormers (3-7) were defeated 50-46 by the Cedar Rapids Titans (7-4) Saturday evening in front of 5,890 fans in Wells Fargo Arena. An intense battle between the Iowa Barnstormers and the Cedar Rapids Titans came down to the final moments of the game. The Barnstormers hit the scoreboard early with a 34-yard touchdown pass from quarterback Taylor Genuser to receiver Brady Roland. On the ensuing possession, the Titans tied the scoreboard tally. A field goal for each team held the scoreboard knotted at the end of the first. Iowa Barnstormers 10, Cedar Rapids Titans 10. In the second the Titans pulled ahead with three consecutive touchdown scores, increasing the point margin by twelve points. Two touchdown completions by receiver Justin Helwege and a quick 9-yard touchdown by Zack Brown were enough to give Cedar Rapids a cushion going in to halftime. Scoring for the Barnstormers, receiver Johnny Thomas grabbed a 10-yard touchdown pass from Genuser. Iowa Barnstormers 17, Cedar Rapids Tians 29. Cedar Rapids’ point margin continued in to the third quarter as the Barnstormers and Titans swapped a pair of touchdowns. A rushing touchdown by running back Robbie Rouse started out the fourth and changed the momentum of the game. An 11-yard touchdown pass to Roland deep in to the end zone pulled the home team back in to the lead. With less than four minutes left to go in the game, the Barnstormers would just need to hold the Titans from reaching the end zone. On kickoff, Demetruce McNeal made his way down the field for a 48-yard kick return. Iowa Barnstormers 46, Cedar Rapids Titans 50. An Iowa Barnstormers game is the perfect event for your next group outing! Discount ticket packages are available for groups of 15 or more and include a video board announcement. 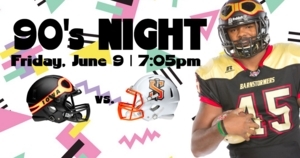 For more information, log on to www.theiowabarnstormers.com or call 515-633-2255.